This is my first recipe in my healing stone line of recipes. 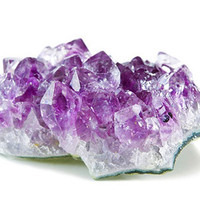 Now I'm not into healing stones at all, but I give out Amethyst for graduations at my work and the meaning of that stone and it got me thinking. What would this taste like in a recipe. I've wanted to make out of the box recipes for variety and creative reasons and this turned out well so I'm going to run with it. Taking this into consideration I wanted to embody the purple color, creamy texture, smooth appearance, and calming feeling. The grape, plum, and dragon fruit create the purple color and bright flavor. This combines with the marshmallow and whipped cream to create a thick smooth vape. The oba oba gives a a candy like depth. All in all is tastes really good and was fun to create. This is a masterpiece. On the first few draws I didn't care for it, I found it too floral and even almost medicinal. But before I needed to redrip, I was in love. It doesn't taste like grape and plum mixed together, it just tastes purple. Purple on a thick bed of fluffy white slightly vanilla-flavored creamy serenity. And while all that healing stones nonsense is bull, there is such a thing as healing flavors, and that's what this is. It's calming and meditative -- everything promised in the description is delivered. Think partly cloudy purple sunset in bottle. Beautiful recipe. Oh man this is amazing! I just recently fell in love with INW Plum and this is an excellent recipe to showcase what a great flavor it is. The taste is beautifully balanced and very flavorful without being too intense. I get an almost gummy vibe from this mix as well. All in all great job! This is probably my new number one fruit/candy profile. Will definitely be remixing this over and over again.